A eulogy delivered after the requiem mass for my great-grandmother Elizabeth Adams. I am posting it online to increase the chances of never losing the text. I’d like to say just a few words before we begin. If you don’t know who I am my name is Aidan and I was Lizzie’s grandson. On behalf of the family, I would like to thank you all for coming today. It has meant a lot to us. We are a small family and my Nana was at the centre of it. Her loss and caring for her over the past year has been very difficult for all of us. Elizabeth was born on the 8th of March, 1919 to Andrew and Helen McGillivray and brought up in the hamlet of Gartgill which was situated near modern day Townhead in Coatbridge. Nana was one of four children who survived infancy alongside her brothers John and William and her sister Catherine. Growing up in this period of time in industrial Lanarkshire was not easy to say the least. The family lived in a house with two rooms with no running water or such luxuries as a toilet. Today we would recognise this as poverty but Nana did not and she spoke fondly of her upbringing. “They were hard times but good times,” she would often say. The McGillivray family was delighted when they moved to Queens Crescent in Bargeddie in the late 1930s and all the mod-coms that came with it in the newly built council housing. The mark the family left on the village is still there in the form of an arched hedge outside number 11 in the street built by Elizabeth’s father, Andrew. One of Elizabeth’s early jobs was to make Communion hosts for the Little Sisters of the Poor in Glasgow’s southside. To get to her place of work Elizabeth would take a tram from Coatbridge to the city centre before walking several miles to the convent. Elizabeth also worked for a GP and also in a bakery. However, like most women of her generation, she gave up working after marriage. She met her husband, William Adams, in the late 1930s and they went on to marry on New Year’s Eve, 1941 at St Bridget’s church in Baillieston. Family photos show them as a stylish couple enjoying married life. A year later their only child Helen was born. The couple spent their early marriage during the Second World War between Bargeddie and Glenboig. Elizabeth’s stories about life during the war would often be the centre of family occasions – usually after pestering her “go on, Nana, tell us a story about the war”. Her favourite tale was about running with a friend during an air raid to pick up souvenir shards of shrapnel as it bounced around the street, much to her parents dismay. Her husband William worked as a miner during the war continued down the pits until his death in September, 1967. Although she was married for 26 years she was a widow for almost double that period. She kept her William’s memory alive throughout her life with stories and tales of happier times to myself and my mum. Nana was a fiercely independent person and who lived at home until her passing. Over the last year Lizzie’s health sadly deteriorated and visits to the hospital and carers became the norm. It was hard for all of the family as you can imagine but we got there. One person who would do anything for Nana was my dad and both myself and my mum and gran would like to take a moment to thank you for everything you did. You lifted and laid her and made sure she was cared for with dignity and love. You were there to make her comfortable right up until her final moments. We love you very much and so did Nana. In healthier and happier times, Nana enjoyed nothing more than spending time with Helen up the bingo, pottering around Coatbridge Main Street getting her shopping and playing the puggies in Nobles. On behalf of my gran, we would like to thank all the staff at Nobles for everything they have done in recent weeks and over the years. Not a birthday went past without gifts or flowers being sent. Besides playing puggies, Lizzie also loved a family holiday and their was only one destination in mind: Blackpool. One Wednesday evening Elizabeth got five numbers in the lottery but unfortunately for her it was a small jackpot that evening but still a nice windfall. She could could have picked anywhere in the world to visit but no she paid for herself and her family to go to Blackpool. There is many things which we miss already about Nana. One of thing I won’t miss however is to walk in to her house to be greeted with “You’re putting the weight on, Aidan”. Then 5 minutes later she’d have the kettle on and a plate of, what can only be properly described as a mound, of biscuits. I don’t think she was able to see any link between my expanding waist line and her biscuit tin. Elizabeth’s life was one of endurance, independence, family and faith. “Work hard and have a good life,” was her advice to me whenever we met. It was advice she could give freely as it was the ethic through which she lived. She was the person who which our small family revolved around and we will all miss her greatly. March 8, 1919 – June 1, 2017. Here you will find a collection of blogposts I made when I was a student interested in current affairs. Any views expressed are not necessarily my views now and are not those of my employer. It was currency unions not military unions which fuelled debate in the final weeks of the independence referendum. Every now and again, however, defence would be raised as a referendum issue. On every occasion the same two arguments from the opposing campaigns would be pushed into spotlight; Better Together would claim that independence would end Royal Navy supported shipyard and Faslane based jobs while Yes Scotland rebutted by explaining that independence would stop Scotland being dragged into more ‘illegal wars’ like the 2003 Iraq war. The backbone of an independent Scotland’s defence policy would be membership of NATO, claimed the Scottish Government. Membership would be on the condition that there would be no hinderance to Edinburgh’s plans to end Faslane as a host to the rUK’s nuclear weapons systems. “Q. 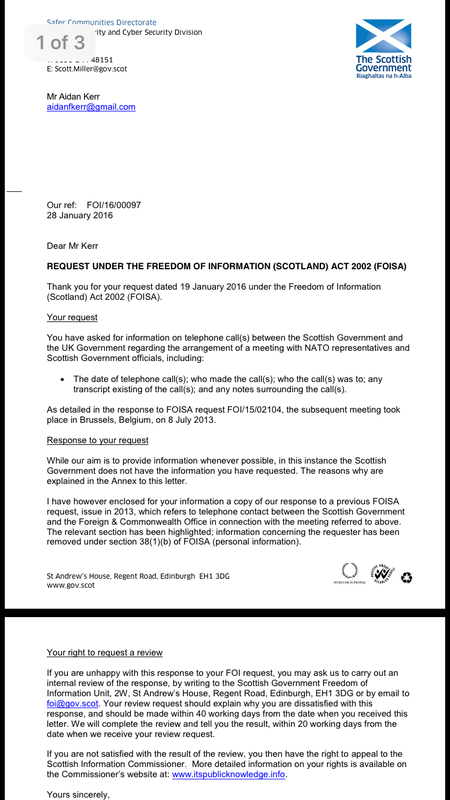 Have there been discussions with NATO about Scotland’s membership? I found this surprising when rereading through my copy of the paper. It seemed that no newspaper had inquired about these two sentences in the document. 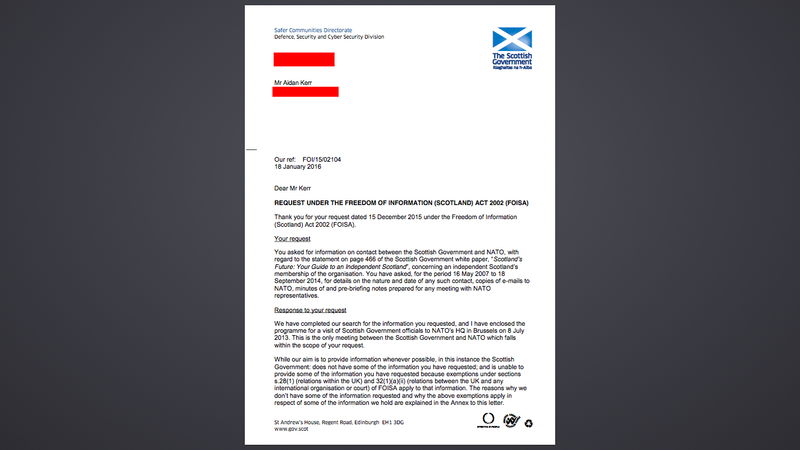 So I sent through a Freedom of Information Request to the Scottish Government to establish what contact was made between these two organisations. 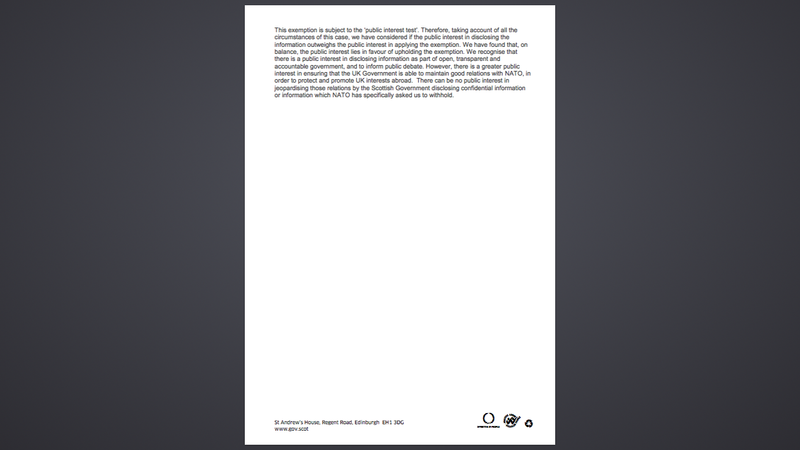 The FOI covered the period of the SNP’s 2007 election victory to the 18th September 2014. I asked for details of all the communications between the two organisations. 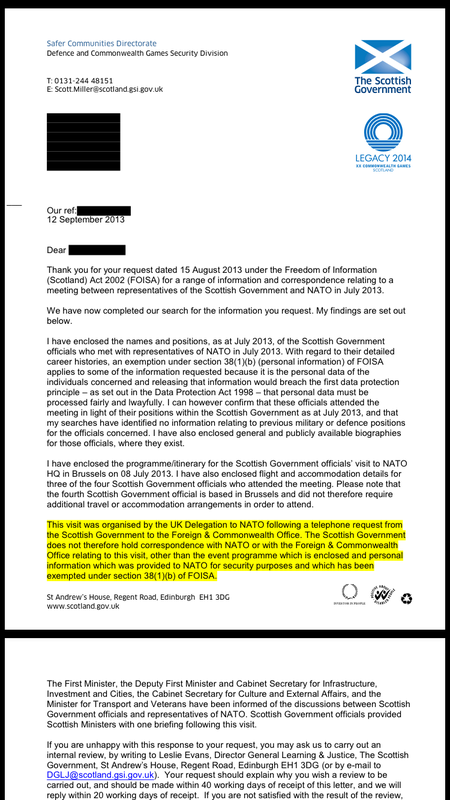 As you can see then the Scottish Government only had one brief contact: a 4 hour visit to Brussels with UK Government officials on 8 July 2013. 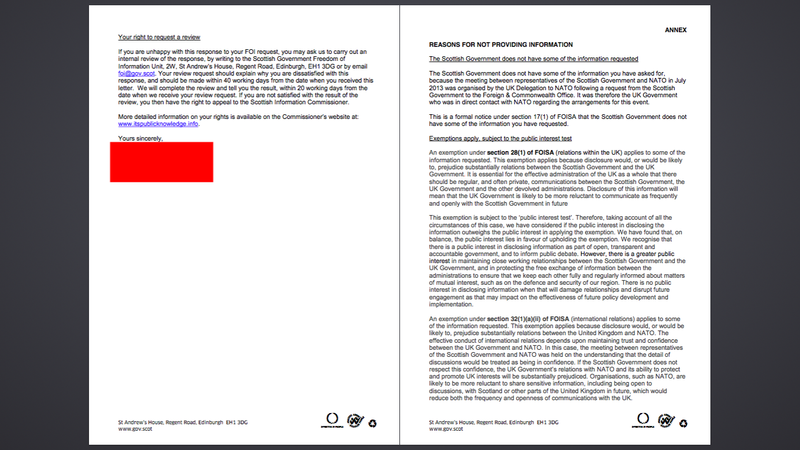 Furthermore, the exemption explanation under section 32(1)(a)(ii) of FOISA 28 states that, “the meeting…was held on the understanding that the detail of discussions would be treated as being in confidence”. This is important. 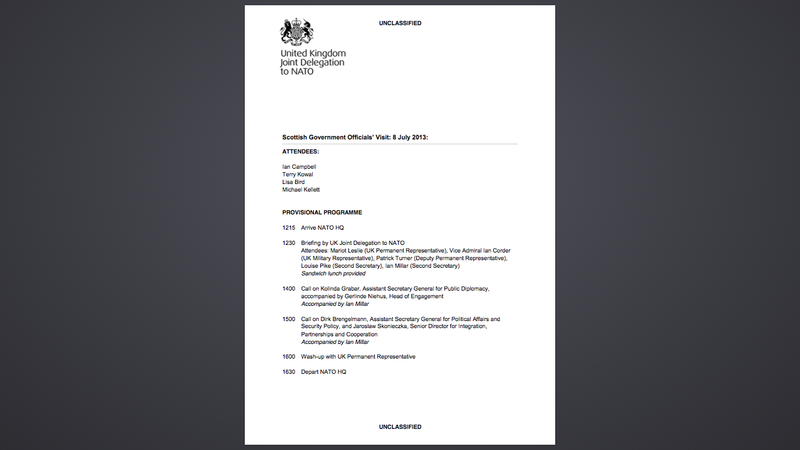 Either one or two things occurred then from this July meeting to the two sentence answer published in November 2013; the Scottish Government broke the confidence agreement on the nature of the talks or they placed the assertion in the document knowing that it would be impossible to establish what was discussed at the meeting due to UK Government – NATO confidence agreements. The matter needs probed further. As an aside to the above blogpost I must stress that I fully believe that if Scotland became independent the balance of probabilities show that it would become a member of NATO, as Montenegro is about to do. This should not however discourage close examination of this most important political and now historic document. Comparisons to Northern Ireland always make some people uncomfortable. Whether it’s the rampant sectarianism, its murderous past or the area’s harsh accent it seems Scots don’t like being compared to our close neighbours. Yet we share not only the same passport and an intertwined history, but now our voting patterns also. For many voters in Scotland the essential dividing line in their party political support is centred on its constitutional position: are they for or against independence. 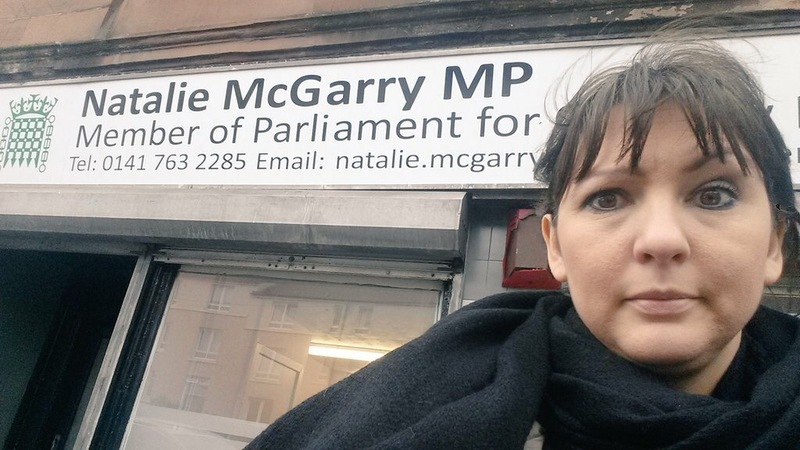 This is the Ulsterisation of Scottish politics, a phenomenon which seems it could be here for a while. As long as people care about independence, or maintaining the Union, first and foremost then the constitution will play a large role in deciding whose box they cross at elections. Elections in Northern Ireland are mini-referendums with political party’s sole existence either to maintain the status-quo or to end the Union’s reach on any part of the island of Ireland. Very few supporters of remaining part of the United Kingdom would vote Sinn Fein or SDLP at any election, indeed few Nationalists would vote for any Unionist candidate. In Northern Ireland it is not “the economy stupid” which fuels electoral support but “the union stupid” which matters most. This is what will grip Scotland’s electorate in the coming May 2015 General Election in Scotland too. The latest ICM poll of Scottish voting intentions had the pro-independence combined popular vote share at 47% and Unionist combined popular vote share at 53%. With margin of errors included, pretty much a mirror image of the referendum result. 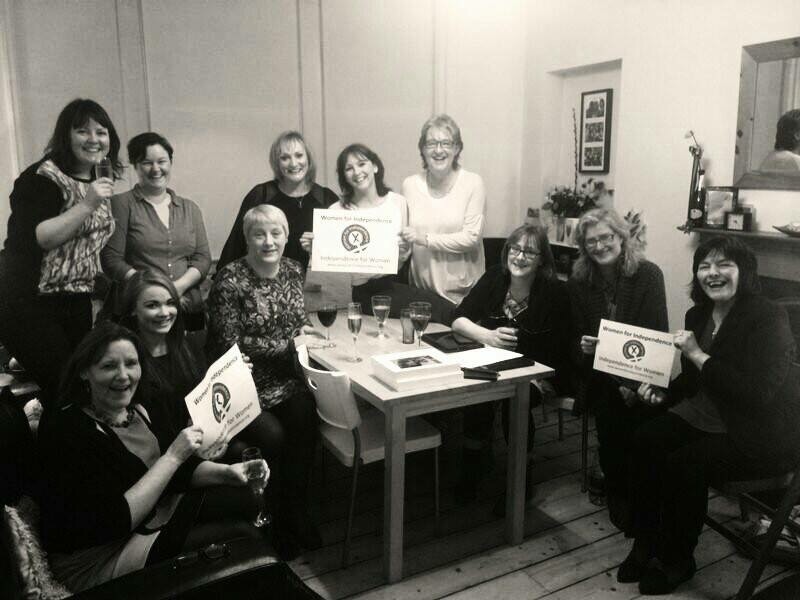 They are many, many reasons for the decline of Labour in Scotland. For any Labourites who wish to halt the decline it would be important to remember that the descent into second place in opinion polls did not begin on after the 18th of September 2014. Indeed, between the 1999 and 2011 Scottish Parliament elections Labour have lost 277,931 votes. The post-referendum decline of Labour’s fortunes centres on those famed ‘traditional Labour voters’ who voted ‘yes’. 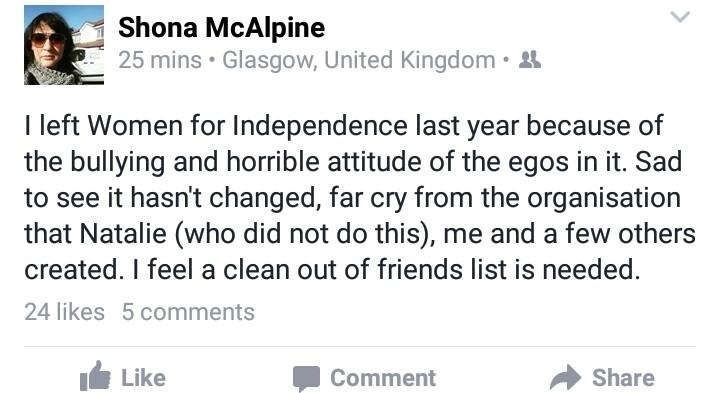 Independence is what their politics revolves around now. They haven’t forgotten about the economy or the NHS, they simply see independence as the answer to any ills that inflict the pair. New Scottish Labour leader Jim Murphy will in 2015 attempt to move the battleground in Scotland away from the constitution and back on traditional Labour pursuits, like saying nasty things about the Tories. I don’t think that will cut the mustard anymore. The constitution is central to people now, be that good or bad. If you care about the Union then it seems illogical, completely illogical, to vote for the SNP even if you support their social policies if there is even a sniff of a second referendum. Perhaps we will even see tactical voting in constituencies to ensure Unionist candidates win and the vote is not split three or four ways. 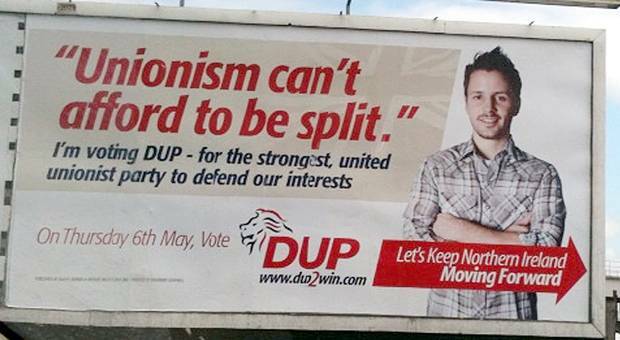 Moreover, even one day we could see electoral pacts at constituency levels like in marginal seats like Fermanagh and South Tyrone, where at the 2010 election, a joint Unionist candidate was selected between the DUP and the UUP. We are a little too early for that, but we are on the trajectory. Former Labour Lord Provost of Glasgow, Michael Kelly voiced his support that Labour voters should vote Liberal Democrat in the Gordon constituency which Alex Salmond is standing in at May’s election. Scotland may not have the harrowing and blood-soaked recent history of Northern Ireland, but it will now have its voting patterns. Welcome to Ulsterisation.